As noted in previous reviews and from looking at the long rich library of games Mario has been in over the years, Mario has done a number of jobs in a number of different genre of games, but would one associate Mario with puzzle games? Using the old grey matter to get Mario out of a predicament that doesn’t involve jumping on Goombas or running under a fire-wielding Bowser? Well Nintendo seem to think so, placing their mascot in a puzzle game involving his dinosaur pal that seems to eat everyone and everything instead of Mario, so how does it fare? It has been noted that puzzle games are great for portable consoles and those on the move (Tetris on the Game Boy springing to mind), so does Mario & Yoshi cause eureka moments, or “You f…” moments? 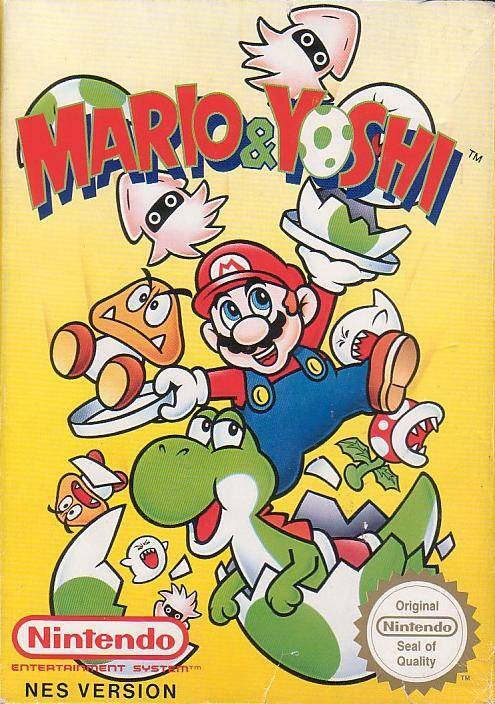 Mario and Yoshi, or in Japan just Yoshi, was released on the NES in 1992 in Europe and is a vertical dropping puzzle game. The idea of the game is that enemies that we have come to know and love from Mario series past drop down from the top of the screen, enemies such as Goombas and Bloopers, and as the player, you have to stack the enemies vertically to make them disappear from the screen. There is a minimum of two enemies that can disappear, however as with games such as Columns, if you don’t line up the enemies then the screen stacks up, where if the stack goes above the top of the screen it is game over. Yoshi is involved in the bottom right of the screen, and by the top half and bottom half of his eggs (well of eggs in his colour) falling at random points. 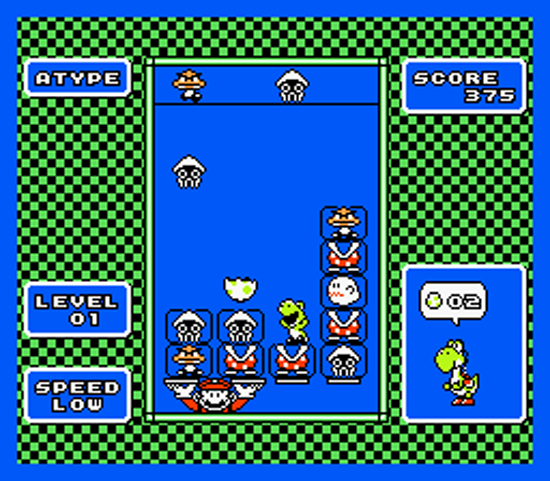 Connect the top half with the bottom half and you get a bonus, which is nice, though what would have been better is if Yoshi came on screen eating every single monster, doing a dance and then running off screen but you don’t always get what you want. So pop the game into your machine, and you get the title screen where you get the option of playing 1 player or 2 player. 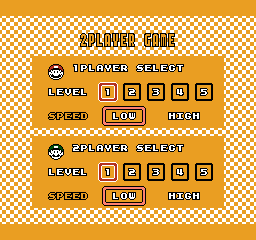 Selecting 1 player you get to choose between game type A or B, though if you’ve not played the game before, you wouldn’t neccessarily know what each game mode does, but that’s the point of exploration. 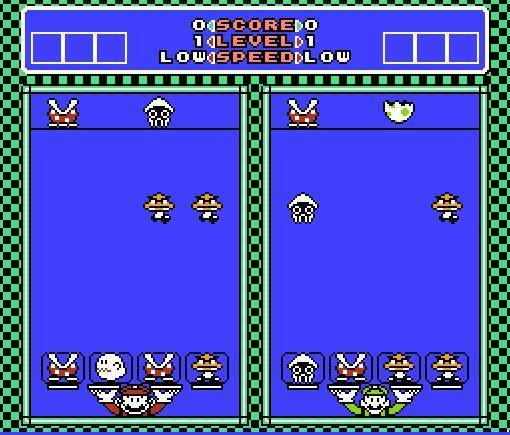 In a menu screen not too similar to Dr Mario, you get to choose the level in which you start at, the speed in which the enemies fall and the background music that plays whilst you endeavour to remove the enemies. After you choose that, you go straight to the game, no back story and no long dialogues of text, just you and Mario that is at the bottom controlling what seems like 4 plates. The enemies fall, and you have to use the d pad to move Mario between two sets of connecting plates, and pressing the A or B button to swap the plates around, which you will need a little bit in the level when enemies are stacked so that you can remove them. It all seems more complicated then it had to, again if looking at Dr Mario and Columns, it feels like you have control of the falling blocks and not fall from random spaces that in Mario and Yoshi you have no control over. If you play 2 player you play split screen, and in essence do what you do in 1 player but just against your friend, it’s not the best multiplayer experience and make you wish you were playing Battletoads instead, friendly fire on as well. The controls are solid where the d-pad moves Mario along the bottom, and pressing down as per other puzzle games makes the enemies fall quicker. The a and B button do the same task, rotating the adjacent stacks what he is controlling which does come in useful, and you do need quick controls because one enemy may fall from the left hand side of the screen whilst the other enemy falls from the far right hand side, so you do need reflexes of a monkey that’s eaten hot gazpacho soup and is burning his tongue. The music is upbeat and done with a lot of care and effort which is always refreshing so you won’t need your Less Than Jake record playing in the background, and makes you question why the best part of a puzzle game is the music? The graphics are bold and clear, appealing to the eye, so the game is treat for the eyes and ears but the old grey matter and your hands may think something different.